I do believe this Verducci Corsa to be one of the best boots on the market at this time. This is the first boot on the market that off the shelf did not rip up my ankles. The arch is perfect for my foot, the arch is about the same as a Simmons boot. I do believe this boot is the lightest boot on the market at 12 ozs for a size 11 boot. Men order one size over your mens street shoe size. Women order the same size as your womens street shoe size. In the picture below I'm doing standing sprints. 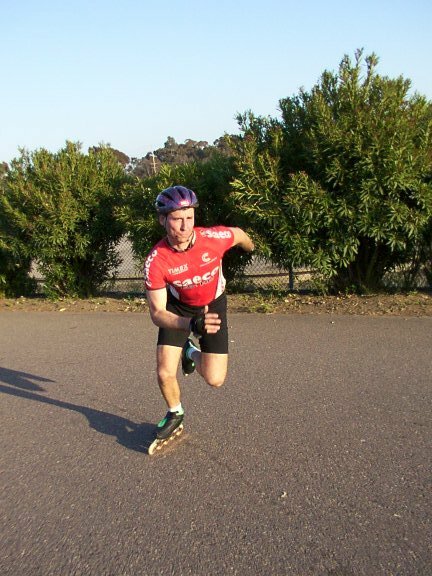 The boot works good for standing sprints but where the boot excels is in continuous high speed skating. 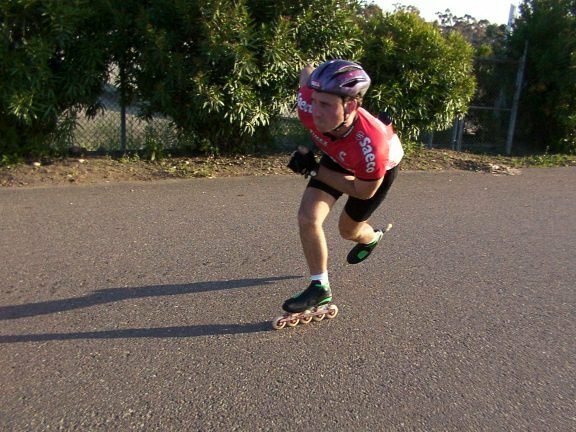 I skate 26 mile marathons and 10k's where the boot works better than most. I use one tab on my left boot and 2 on my right. The tabs allow me to move my frame to the center of the boot front and back and still get an outside edge. Without the tabs I have to move my frames way to the inside and even doing that it doesn't feel right. You don't want to use more than two tabs on a boot which is 2 degrees (1 degree per tab), if you feel you need more than two tabs you probably need to work on your form. 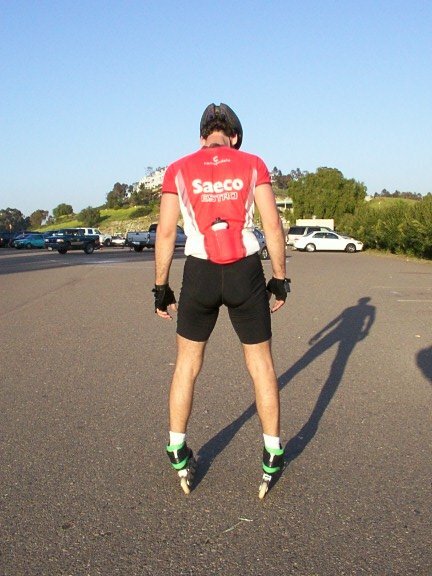 Looking at the picture below you should practice skating with your feet in this anti-pronated position (ankles are falling out). Now with any other boot (and I mean any) this position would cause excruciating pain but the Corsa cuff works like no other boot on the market as far as the smoothness and support of the upper cuff. Again in the picture below the frame is at a 45 degree angle (in an anti-pronated position) to the ground. Now you want to do this for one day, one week or one month depending on how much of a problem you have with pronation. 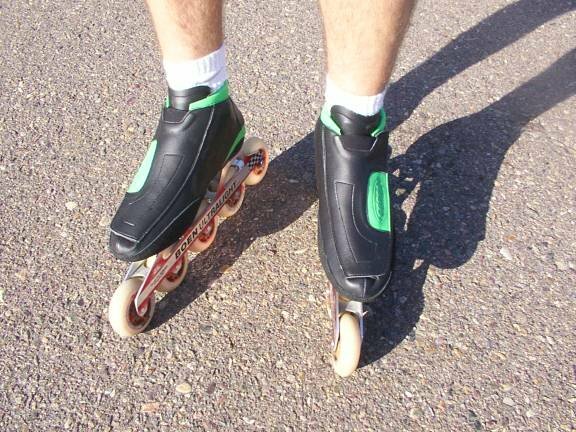 Then after doing this for an extended amount of time you can allow your ankles to relax and your frame will be at a 90 degree angle to the ground instead of relaxing and the frame being at a 45 degree angle to the ground in a pronated position (ankles falling to inside). Also we have found the boot works best leaving the bottom laces looser and just tighten the top lace. This boot is very supportive so you don't need to lace the bottom as tight as some of the other boots to gain support. Double push is no problem with this boot and the cuff height is just right. In the pict below I'm doing crossovers. Again crossovers in this boot work good but where this boot excels is long distance high speed. I believe this boot to be the most comfortable off the shelf boot on the market. If you were to have a problem, this boot it is one of the easiest to heat mold on the market. With a $240 price tag this boot is a bargain, I would choose it for comfort over any boot on the market at this time, even over the higher cost boots. Please email: support@nettracing.com if you have any questions.